Pole barn construction has always been recognized for equipment storage, barns, storage units, and similar buildings. Nowadays, pole barns are becoming increasingly popular for residential applications because of their incredible benefits including: easy construction, versatility, energy efficiency, and customization options. Here in East Moline, IL, Greiner Buildings is your number one contact for pole barn construction in the Midwest. Whatever type of building you are in need of, we can design and construct it for you. We specialize in custom pole barn homes, and have also created our very own combination of shop and home, called the Shome®. Featuring wide open living areas, high ceilings, large windows and doors, and of course, a custom attached shop, the Shome® is the perfect solution for modern day country living. For more information about building your very own Greiner Buildings Shome® in East Moline, click here. We also provide post frame commercial buildings to business owners in East Moline, IL. We have built everything from gorgeous wedding barns to elite office spaces. Whether you are looking to construct a retail building, restaurant, automotive center, or indoor arena, Greiner Buildings is the way to go. 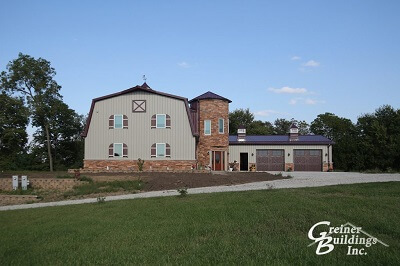 We will work with you to understand the scope of your project, create a design that you love, and bring it to completion with a custom pole barn. Give us a call today to get started with your free quote.